The same insects that might make your skin crawl represent a tasty meal for a number of mammal species. A few mammals prey exclusively on insects, while others have varied diets that also include plant matter and even fellow vertebrates. In some cases, such mammals provide a useful service to humans by controlling the populations of insects that transmit diseases or attack agricultural crops. Vampire bats -- those that feed on blood -- may be the most familiar to the popular imagination, but they are hardly representative of the more than 900 bat species. While there are only three vampire species, about 70 percent of bats feed on insects such as moths, mosquitoes and beetles. Such bats -- Brazilian free-tailed bats, for example -- emit high-pitched sounds that bounce off insects and produce an echo that reveals the prey’s location. Using this technique, known as echolocation, a bat can eat half its body weight in insects in a single night, to the delight of many a farmer. Found only in the Americas, anteaters and armadillos, which are placed into the taxonomic category Xenarthra due to skeletal commonalities, are insectivores. 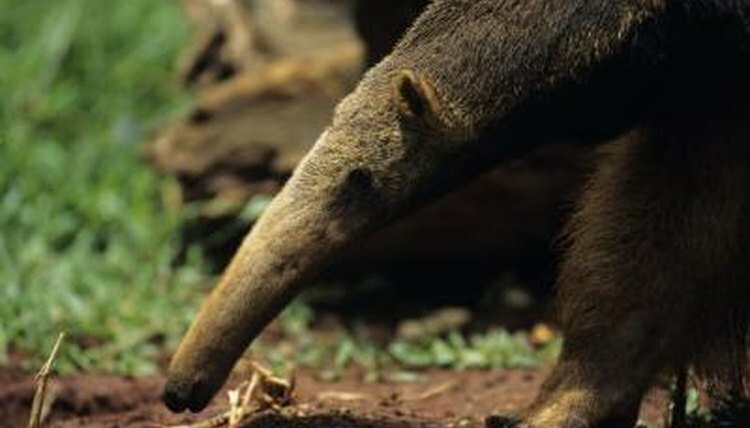 Anteaters use a long, thin tongue drenched in a sticky saliva to extract ants and termites from the ground. Armadillos, known for their protective body armor, are also largely insectivorous, with some species consuming only ants. In an example of convergent evolution -- unrelated species that develop similar characteristics and fill comparable ecological niches -- Africa's aardvarks also have a predilection for termites and use sticky tongues to access them. Moreover, anteaters, armadillos and aardvarks all employ strong front claws to dig for prey. Known for their spiky quills -- specialized hairs made out of keratin -- and their ability to curl into a prickly ball to dissuade predators, hedgehogs, which are native to Europe, Asia and Africa and have been introduced in New Zealand, are highly insectivorous. A hedgehog's meal may include beetles, caterpillars, grasshoppers, millipedes, termites and moths. In their search for these creatures, hedgehogs are aided by curved claws designed for digging and well-developed senses of hearing and smell. Because they prey on pest species, hedgehogs have long endeared themselves to gardeners. Hedgehogs belong to the abandoned taxonomic order Insectivora, which also encompassed other small insect-eating mammals, including shrews and tenrecs. Found everywhere except the poles and Australia, shrews, of which there are some 300 species, must consume large amounts of insects often to support their high metabolic rate. Tenrecs, which occur on the island of Madagascar, eat insects and their larvae. A few species have highly specialized diets, like the streaked tenrec, which has a particular appetite for earthworms. Some tenrecs resemble hedgehogs; others look like shrews. Insects make up part, albeit small in some cases, of the diet of several omnivorous mammals, such as North America's black bear and Central and South America's coatimundi, which is related to the raccoon. The opossum, a type of marsupial, is also a generalist that preys on insects and worms.